Senior year homecoming is a big deal, and the question of who to ask can be overwhelming. Even a little traumatic if there isn’t an obvious choice of partner. But Buzzfeed let us know that 18-year-old Joe LaRue from Ohio (aka, our new hero) has changed the game…by asking himself to the dance and documenting the whole thing on Twitter. Now, everyone loves an EPIC invite, so LaRue made sure he didn’t disappoint. Okay, you’re probably wondering…why? And that’s valid. So apparently, the whole thing was his mom’s idea. Come again? Here’s how LaRue explained it to Buzzfeed News. "My mom asked me if I was going to homecoming, and I was like, ‘No, I can’t find a date, so I’m just not going to go. And she said, ‘It would be kind of funny if you asked yourself." So, as any solid mother/son comedy duo would do, they started brainstorming invite ideas. 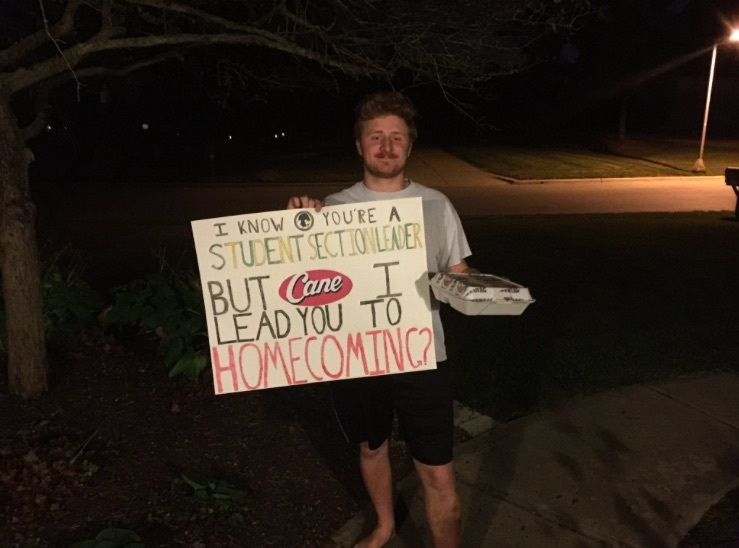 He decided when he was at his favorite fried chicken restaurant — Cane’s — to incorporate his favorite food into the language of his proposal. You know, to make it personal. The post has been retweeted tens of thousands of times and we’re officially bowing down to this kid. Seriously — where was he when we were in high school?! "High school goes by fast, so you have to take every opportunity." Um, did we mention that he’s also incredibly wise?! And while we’re not totally thrilled with LaRue’s comment about not trusting girls, we also know that being a teen is angsty AF, so we’re willing to let it slide. Have a killer time at homecoming, Joe!